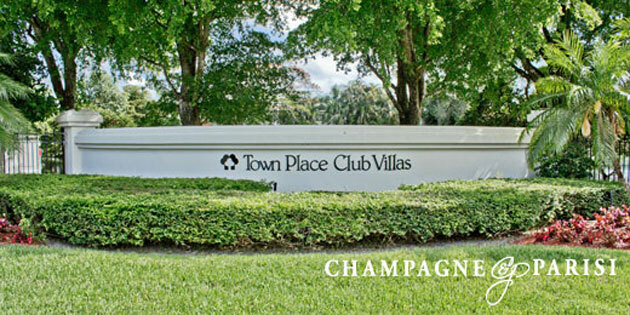 Town Place Club Villas is an upscale, gated residential community located in Central Boca Raton, FL. This luxurious community consists of just under 120 semi-attached and detached single family homes that feature refreshing Mediterranean-style architecture surrounded by lush, tropical landscape. Homes in Town Place Club Villas offer 2- and 3- bedroom floor plans and feature many high-end upgrades. Complete with marble flooring, spacious walk-in closets, gas fireplaces, roman tubs, gourmet kitchens with granite countertops and stainless steel appliances, and countless additional upgrades, homes in Town Place Club Villas leave little to be desired. Many of the homes also feature large backyards with private pools and gorgeous lake views. The community offers residents a 24-hour manned security gate, a beautiful cabana-style clubhouse complete with an upgraded full kitchen, a large sparkling community pool with sundeck and lounge chairs, and a hot tub perfect for relaxing after a long day. The HOA fees for Town Place Club Villas cover the maintenance of the common areas and amenities, as well as basic cable. Located across the street from the Town Center Mall next to the Swim & Racquet Club on St. Andrews Boulevard, Town Place Club Villas is a highly desirable place to call home due to its convenient location. Just minutes from Mizner Park, University Commons Shopping Center, the beautiful Boca beaches, community parks, and major highways, residents are able to conveniently enjoy all that Boca Raton and the surrounding areas have to offer. Town Place Club Villas is currently zoned for some of Boca Raton's top-rated schools, including Verde Elementary, Omni Middle, and Spanish River Community High School. If you would like to learn more about Town Place Club Villas or any of the surrounding gated communities in the area, please contact us at 561-998-9015. You can also reach us by using our simple online contact form below. We look forward to assisting you in finding your next dream home. Also, please consider registering for a free account which will enable you to receive automatic email notifications when new homes in Town Place Club Villas come on the market in Boca Raton, FL.